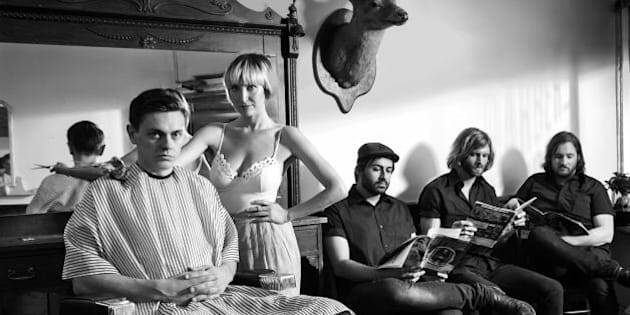 Toronto boy-girl blues rockers July Talk are a year out from their self-titled debut album, but have picked up so much momentum from the runaway success of radio smash "Guns + Ammunition" that they're re-releasing an expanded version of the album (streaming below). To mark the occasion, HuffPost Canada Music is premiering a behind-the-scenes video of the "Guns + Ammunition" studio recording sessions. "It was really important to us for 'Guns + Ammunition' to feel tight and restrained," says singer Peter Dreimanis of the recording. "The guitars are largely played on one string and the cymbals were all recorded separately to keep the dancey pulse and vocals at the forefront. The progression is very cyclical and we wanted the arrangement to dictate that by letting notes from different instruments weave in and out of each other rather than playing full chords on each. There's no full chords in the entire recording."